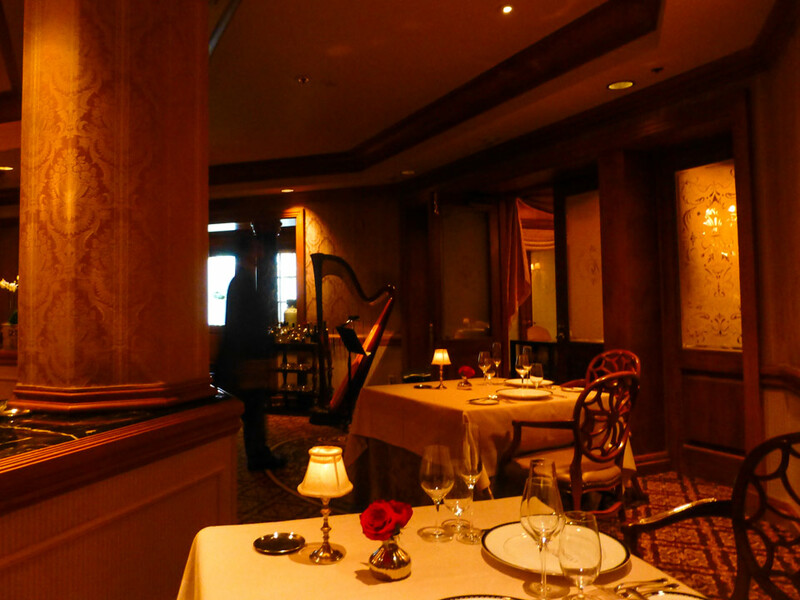 Dining at Victoria & Albert’s was always near the top of my Disney World bucket list. I always wanted to enjoy a luxurious dinner at this AAA Five Diamond Award restaurant, but with prices starting at $135 a person, I couldn’t justify the money. I just figured I could go to 2 signature restaurants for the price of Victoria & Albert’s. Also, the food offerings at Victoria & Albert’s are exotic, and I thought that might not mix well with my somewhat restricted diet. My husband and I recently received a gift to dine at Victoria & Albert’s from my daughter and her family as a way to celebrate our anniversary. I was stunned by her generosity, but I was fearful that she had spent too much money on a meal I might not even be able to enjoy. Well I’m here to tell you, I was 100% wrong. My husband and I were able to secure a reservation at Victoria & Albert’s before our last trip to Disney World. One of my initial fears was washed away before we even got to the Grand Floridian. As I stated before, I thought my few dietary restrictions might be an issue with the food. This concern was rectified when the restaurant called prior to my arrival to address any concerns I had or dietary restrictions. However, they told me they wouldn’t have to modify anything, as all the food was prepared without anything that I would have a problem with, such as extreme spice or excess sodium. It was great to know this before heading to the restaurant. On the night that we went, I remember noticing how nice it was to get dressed up and out of “park clothes” for an evening. When we arrived at the Grand Floridian, we were greeted as soon as we pulled up. Being a pin trader, I actually traded pins with the Grand Floridian greeter and received one of the best pins I had ever traded for. My initial hesitations about this special dinner were almost instantly washed away when we got to the restaurant. The staff at Victoria & Albert ‘s made us feel very welcome. I now had a really good feeling. We choose to dine in Victorian & Albert’s main dining room. It’s small and beautiful. Victorian decor adorns the room, with tables arranged circularly around a spectacular floral centerpiece. During the evening, guests are allowed to take a photo in front of this lovely centerpiece. We were instantly seated at a beautiful Victorian table. Once we got to our table, a foot stool was presented to me beside my chair to put my purse on. That little touch of luxury clued me into the fact that I was in store for a very special evening. Victoria & Albert’s is Disney at its best. The restaurant has a relaxed elegant atmosphere. The service is impeccable, and the friendly staff members are examples of excellence personified. 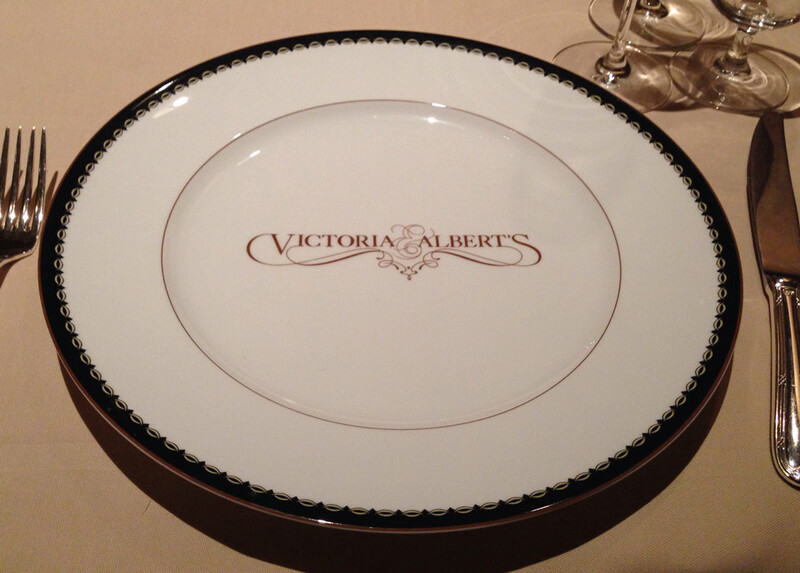 Disney Cast Members at Victoria & Albert’s make you feel special and pamper you throughout the entire meal. Our fantastic server presented us each with a personalized menu with our names and a message of “Happy Anniversary” on it. Perfection is in all the small details at Victoria & Albert’s. The main dining room offers a seven course menu. Diners are allowed to choose from a selection of around three offerings per course, one of which is usually a vegetarian choice. My husband and I picked most of the same offerings throughout the menu with the exception of dessert. The cuisine features ingredients from all over the globe. Every choice was perfectly prepared and incredibly delicious. 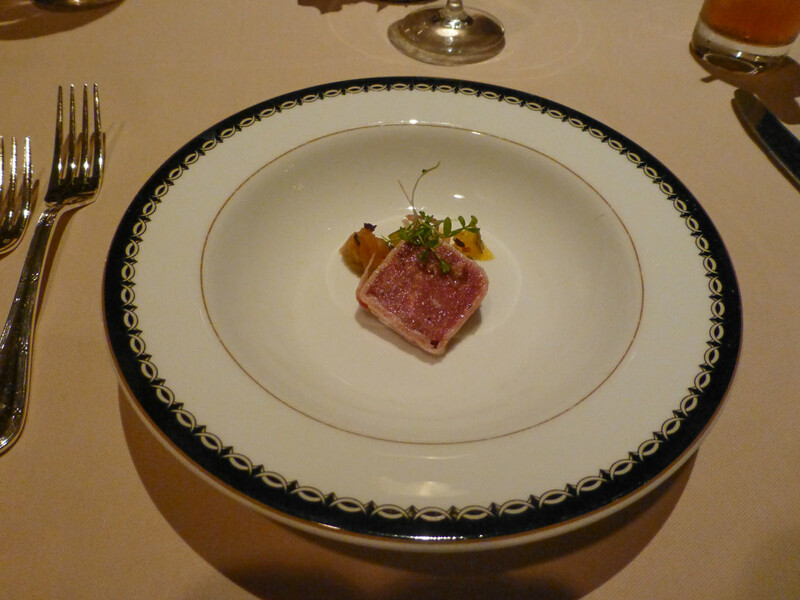 The beautiful presentation of each dish was both stunning and luxurious. Each course is a small portion however it will fill you up quicker than you think. The Loch Duart salmon was the best I had ever eaten. (Not that I’d ever had this particular salmon before.) 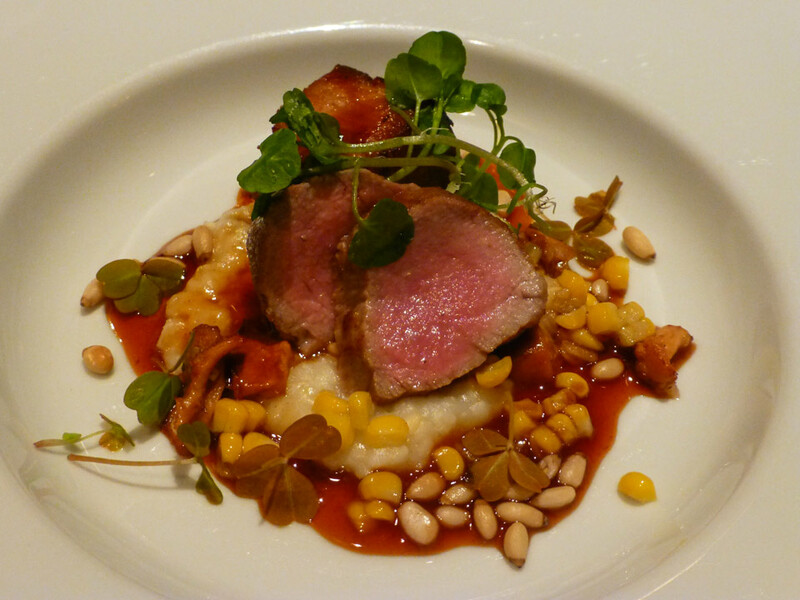 The Niman Ranch Lamb was equally as delicious. The Berkshire Pork was incredible. Are you noticing a trend here? Victoria & Albert’s offers three distinct bread offerings that accompany your meal, and even that was amazing. Everything was very fresh and prepared to delight. 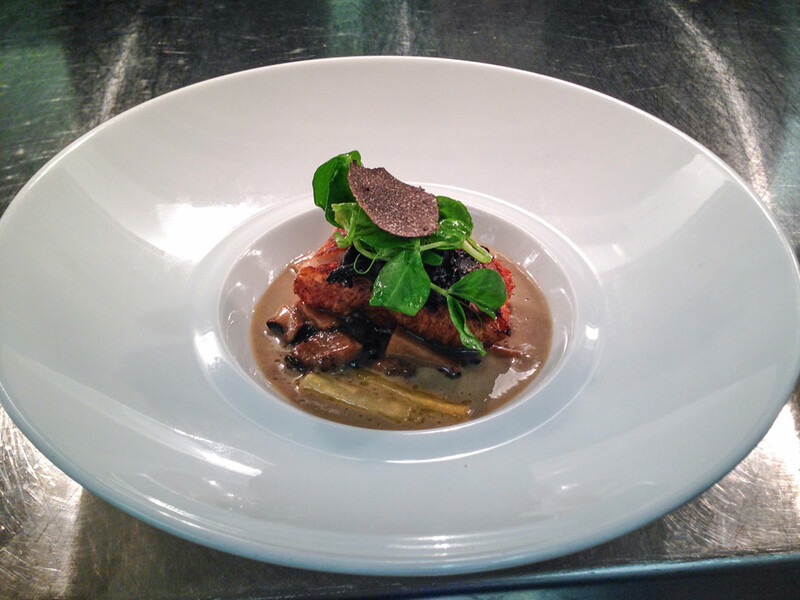 Victoria & Albert’s elevate the entire dining experience, from the service to the cuisine, to an art form. It’s no surprise that Victoria and Albert has earned the AAA Five Diamond Award every year since 2000. I never really gave much importance to the the Five Diamond review; however, now I can see how this restaurant is a step above any other on Disney property. How could this evening get any better? Well, the dessert course arrived. Dessert was offered as a selection between six sugary works of art. 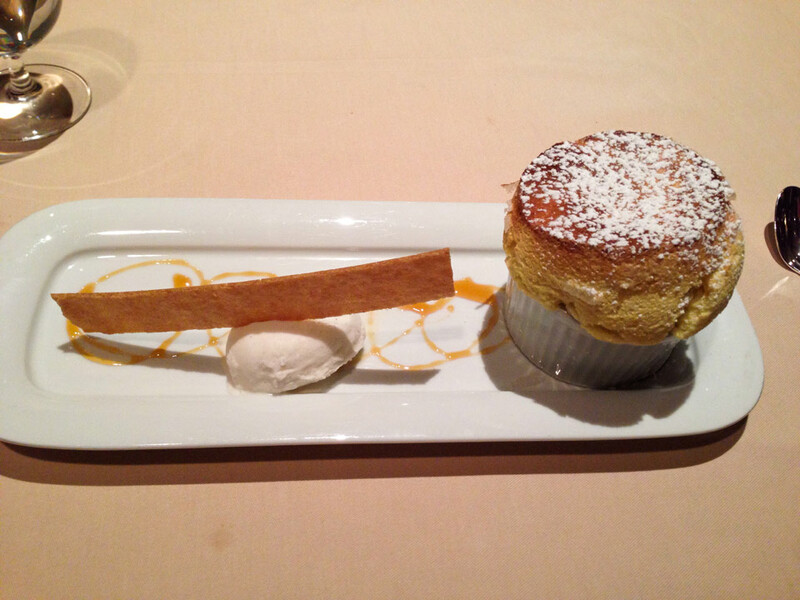 I chose the Hawaiian Kona chocolate soufflé, and my husband had the Grand Marnier soufflé. They were both perfection. 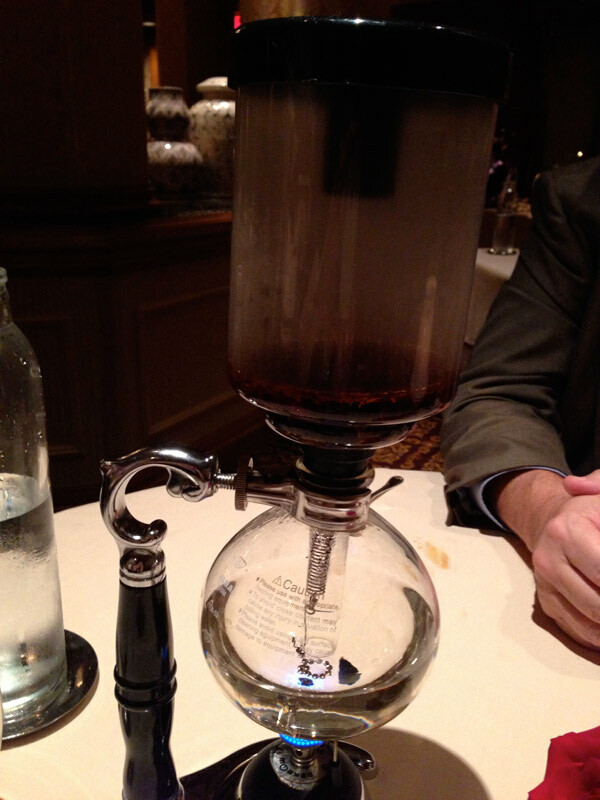 After dessert, we had a fun surprise in the coffee/tea infusion pot. I ordered a vanilla tea that was made in this infusion teapot. It is hands down the best cup of tea I have ever had. The teapot is somewhat like a magic trick at the liquid on the bottom steeps up to the top. 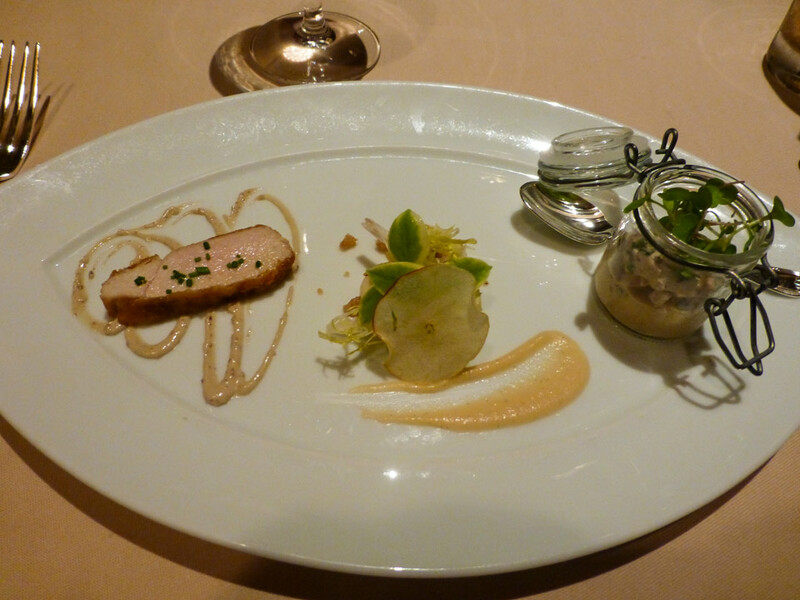 Thinking back on each course, the dessert, and tea leaves me longing for Victoria & Albert’s. This experience is more than eating dinner. It’s being pampered for a evening and feeling like a VIP. For an anniversary or special birthday, Victoria & Albert’s should be at the top of your list. Believe it or not, Victoria and Albert’s offers an even more decadent experience with their Queen Victoria dining room and the Chef’s Table that offer 10 to 12 course meals. At the time I went to Victoria Albert in the spring 2014, eating in the main dining room come with a price of $135 per person. With wine pairings it run $200 a person.The Queen room and the Chefs Table will set you back $210 per person and $315 with wine pairings. All in all, Victorian & Albert’s is a superior dining experience worth the money. What a wonderful way to celebrate your anniversary!